Looking for a new truck this summer? Visit Midwest Motors in Eureka, Missouri and check out our 2014 Toyota Tundra SR5. Featuring a Fabtech Motorsports lift kit that gives the truck aggressive looks and offload capability. Also equipped are black and silver BMF wheels with blacked out Toyota center caps. This 4wd, 5.7L V8 truck also features side step rails for easy entry into the cabin. The custom added front skid plate means you can conquer any obstacle, and the WeatherTech rain guards nicely accent the exterior. To top it all off, the rear end features smoked tail lights that really set off the look on this truck. If you’d like to take this truck for a test drive, give us a call at (636) 938 5777, or visit us online, at midwestmotors.biz today! What Makes The Ford F-150 SVT Raptor So Amazing? With a 411-horsepower, 6.2-liter V8 engine, and aggressive styling, our Ford Raptor is one sweet truck! Last year saw the addition of a Torsen limited-slip front differential and a nifty, front-facing camera, both of which are quite handy for rock climbing. For 2013, new 17-inch forged aluminum wheels have been added, and they feature a patented bead-lock system for keeping the 35-inch-tall tires on the rims at very low pressures. Along with the cosmetic differences between the Raptor and the standard F-150, the Raptor has a 73.6-inch track – nearly seven inches wider than the track on the standard F-150. This equates to more stability and more confidence when hitting the off road park! After upgrading the F-150 SVT Raptor significantly for the 2012 model year, there were even more changes for 2013, including standard high-intensity discharge (HID) headlamps, Hill Descent Control, and forged bead-lock capable wheels. This is a fully off-road capable truck, with triple-bypass Fox Racing Shox, aluminum front suspension arms, and generous wheel travel - turning even the bumpiest roads in to a slice of cake. 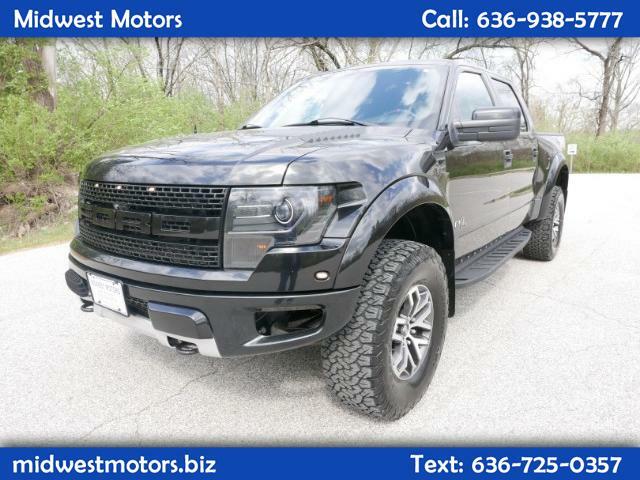 If you are looking for a truck that will help you stand out - Check out Midwest Motors' Ford Raptor SVT!